erm, the usual sort of premiums do not apply to the islands - I started using Jacksons when I lived in Kirkwall, as postage was free over £39, and no extra mark up below this. It was the only art materials supplier for which this was true. Don't know if that is still the case, though! Surprised to hear you going with the "The usual sort of premiums apply to the Islands and Ireland." as if this were okay. Royal Mail prices are universal, and charging a premium to post a tube of paint or brush north is a ripoff. Too many "free UK shipping" instances stop at Glasgow. GreatArt charge £15 (!) extra. Jacksons are to be commended for their shipping policies, which does include price and weight points at which Highlands gets free shipping. And their great customer service. It wast no sort of comment - as you seem to be suggesting - on whether or not the practice is fair. It was merely highlighting that it happens very frequently. Do bear in mind that not all retailers use Royal Mail and/or ParcelForce - with good reason some may suggest. Instead a number of retailers trust their goods to couriers who do charge a premium. In which case they are merely passing on the premium. 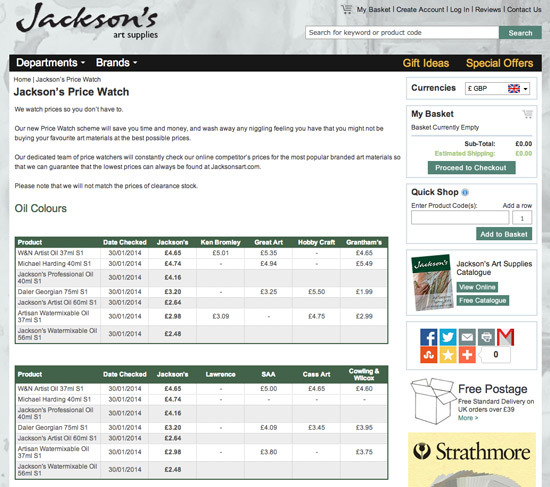 A lot of retailers also do whatJackson's do and identify pricepoints at which shipping is free. It's the customer's choice as to which retailer they buy from AFTER they have factored in the cost of shipping. My recommendation stands - ALWAYS check on what the total cost is including shipping BEFORE placing an order.